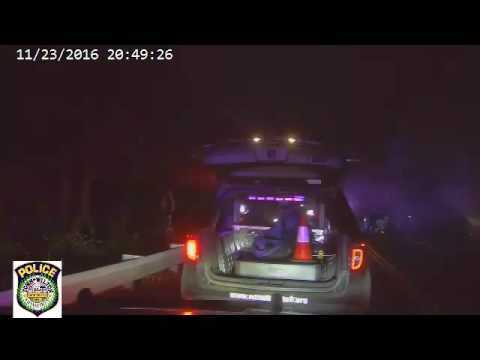 WILTON, Conn. -- Wilton Police released video from an on-board camera from a cruiser of their role in the rescue of a 26-year-old Wilton man from a burning Range Rover after an accident last week. Six officers struggled to free Hunter Stanfield, 26, whose legs were caught in an area underneath the steering wheel in the night-time crash on Nov. 23 at 198 New Canaan Road. Hunter Stanfield, of 30 Bittersweet Trail, trapped in the front of his vehicle while the engine compartment burned. The engine compartment was burning, and officers were finally able to pull him free just before the vehicle's interior was engulfed in flames. "It was quite dramatic," Capt. John Lynch said Tuesday. "They saved his life." Six officers, including two sergeants who were during traffic enforcement for Thanksgiving Eve, responded to the scene. They couldn't get the driver's door open, but they were able to get a back door and the back hatch open and crawled inside. Finally, the officers were able to pull Stanfield out of the vehicle and put him down on the ground. However, the flames quickly spread and fully engulfed the vehicle, Lynch said. "It was great teamwork," he said.